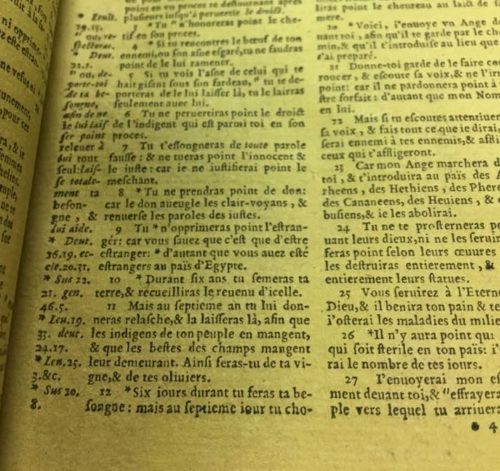 The mystery this month isn’t about what the text is (these pages are excerpts from a Calvinist Bible in French printed in Geneva in 1588) but rather it’s about the paper. What is going on here? Leave your thoughts and guesses in the comments and we’ll be back next week with more information. the grain of the paper is not running with the fold. Rik and John, thank you for your guesses. What is intriguing about this paper is its color. It is not a photographic effect: this paper is really yellow. Have you ever seen anything like this? From a current perspective….yellow journalism? Perhaps the pages of the bible have been tinted? 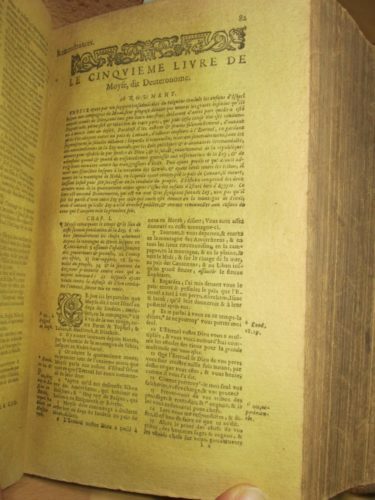 I remember reading that in the 1600s,bookbinders, at their customer’s request, would stain the pages of the books with sap green, for a particularly stylish finish. Perhaps that is what happened to our bible? Charles Babbage’s table of logarithms was also initially printed on yellow paper ( he mentions the fact in the introduction of the 4th edition) . Babbage tells us that yellow paper made the numbers appear more distinct. Perhaps similar thoughts were running through the mind whoever stained the pages of this bible? Urine in the pulp/stuff (instead of or in addition to lye)? Is this hay or straw paper? Just in case any of you are following these comments but didn’t spot the follow-up blog, the discussion has continued at http://collation.folger.edu/2017/03/a-yellow-book/ .